Tottenham Hotspur are allegedly working on a plan to move from White Hart Lane to the Olympic Stadium after the 2012 Olympics. This move arrives after local police and heritage groups in Tottenham, North London, rejected proposals by Tottenham Hotspur football club to develop a new stadium next to their current one on White Hart Lane. Tottenham football club have had plans for several years now to build a new stadium, which would allow larger attendances and therefore greater revenue, but local opposition has consistently held them back. The new proposal, to move to East London and the Olympic Stadium, will not be appreciated by the majority of Tottenham Hotspur football fans. 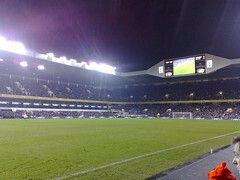 Tottenham’s roots are traditionally in North London, the Olympic Stadium is in East London. Some fans even suggest the move is just a smart scheme to pressurise the local communities currently opposing the scheme into accepting it. Construction on the stadium and all connected operations would lead to large investment in the Tottenham area which the local community would be loathe to lose. It appears the local community currently opposing the project are not actually against the idea in principle but merely opposing it with the intention of securing a better deal for the local community, at the club’s expense. Hugh Robertson MP, the sports minister, has stated that he wants the Olympic Stadium, built at taxpayers expense, to be used by a club that can guarantee its upkeep and legacy. Hugh Robertson MP has said the British government does not want to see a stadium that is allowed to decay into ruin through non-use. Simply put, the member of parliament is saying he wants a big sporting club with guaranteed following to use the stadium. It will still come as a surprise to some British taxpayers that the government is to allow the stadium to be used by a football club anyhow. When the Olympic 2012 bid was created the then government promised the stadium would be used primarily for athletic purposes after the 2012 Olympics had closed. It now appears almost certain that the Olympic stadium will end up being used by either West Ham or Tottenham, London football clubs.